St. Felix of Nola was a Christian presbyter at Nola, near Naples, Italy. He sold off his possessions in order to give to the poor, but was arrested and tortured for his Christian faith during the persecution of Emperor Decius. Felix was the oldest son of Hermias, a Syrian soldier who had retired to Nola, Italy. After the passing of his father, he sold off his belongings, gave the money to the poor, and pursued a clerical vocation. St. Maximus ordained Felix, and they worked together. Bishop Maximus fled to the mountains to escape the persecution of the Roman Emperor Decius, but Felix remained and was arrested, and beaten for his faith. He escaped prison; legend has it that an angel freed him, so he could help Bishop Maximus. When he found Maximus alone, ill, and helpless, he hid him from the soldiers in a vacant building. When the two were safely inside, a spider quickly spun a web over the door, fooling the imperial forces into thinking it was long abandoned. They left without finding them. Later on, an attempt to arrest Felix followed, which he avoided by hiding in a ruined building where again, a spider’s web spun across the entrance, convincing the soldiers that the building was abandoned as well. The two managed to hide from authorities until the persecution ended with the death of Emperor Decius in 251. After Maximus’s death, the people wanted Felix to be the next Bishop of Nola, but he declined. He continued on as a Priest, and continued to farm his land, and gave most of the proceeds to people even poorer than himself. 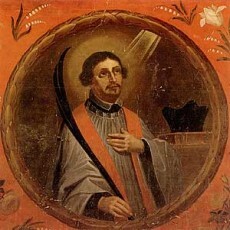 It is believed that St. Felix of Nola was martyred for his faith in 255 under the Emperor Valerian. Much of the information we have about this saint comes from the letters and poetry of St. Paulinus of Nola, who served at the door of the Church dedicated to St. Felix, and who gathered information about him. A Church was built in Nola dedicated to St. Felix, the place of his burial. St. Felix of Nola was a young spiritual man, who sold his belongings when his father died and gave the money to the poor. He did this so he could pursue a clerical vocation. His Bishop, St. Maximus, ordained him a Priest. He was a close friend of Bishop Maximus, and helped to hide him from the persecution being carried out by Decius. He was arrested and miraculously freed by an Angel. Several times while hiding St. Maximus his Bishop, a spider would weave a web over the doorway of the buildings they were hiding in, leaving the soldiers believing the buildings were abandoned. He is listed in the General Roman Calendar as a Confessor of the Faith, and his feast day is January 14th.